In Speech, Sen. McCain Decries 'Half-Baked, Spurious Nationalism' : The Two-Way Following his acceptance of the Liberty Medal from the National Constitution Center in Philadelphia, John McCain said U.S. abandonment of global leadership is "unpatriotic." 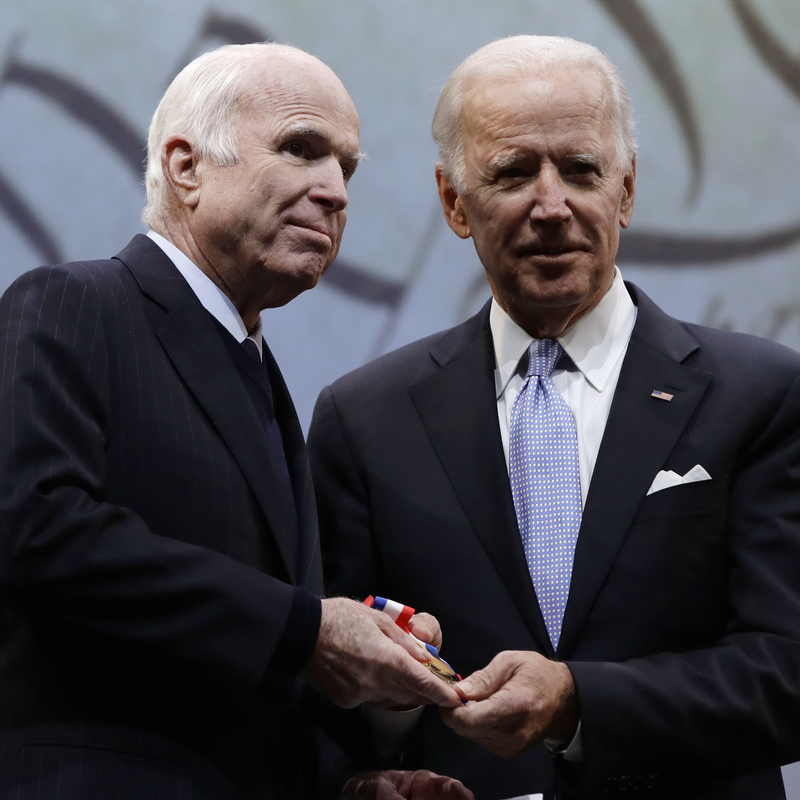 Sen. John McCain, R-Ariz., receives the Liberty Medal from former Vice President Joe Biden, chairman of the National Constitution Center's Board of Trustees, in Philadelphia on Monday. In what appeared to be a thinly veiled reference to politics in the Age of Trump, Sen. John McCain on Monday warned Americans against "half-baked, spurious nationalism," calling the abandonment of U.S. global leadership "unpatriotic." Speaking in Philadelphia, where he was being honored with the Liberty Medal by the National Constitution Center, McCain did not mention the president by name, but his words appeared to be aimed at Trump and his administration. In an apparent reference to white supremacists who sparked violence in Charlottesville, Va., in August, McCain said: "We live in a land of ideals, not blood and soil." The Nazi slogan "blood and soil" was shouted by tiki-torch-wielding demonstrators in Charlottesville. "We are the custodians of those ideals at home and their champion abroad," he said. "We have done great good in the world. That leadership has had its costs, but we have become incomparably powerful and wealthy as we did." "We have a moral obligation to continue in our just cause, and we would bring more than shame on ourselves if we don't," McCain continued. "We will not thrive in a world where our leadership and ideals are absent. We wouldn't deserve to." Biden, the Delaware Democrat who once served alongside McCain in the Senate, said: "We often argued — sometimes passionately. But we believed in each other's patriotism and the sincerity of each other's convictions. We believed in the institution we were privileged to serve in." Biden alluded to McCain's torture during more than five years spent as a prisoner of war after his U.S. Navy A-4 was shot down over North Vietnam in 1967. "John, you have broken many times, physically and otherwise, and you have always grown stronger, but what you don't really understand in my humble opinion is how much courage you give the rest of us looking at you," Biden said. McCain was diagnosed with brain cancer in July.